The 2009 California wildfires were a series of 8,291 wildfires that were active in the state of California, during the year 2009. The fires burned more than 404,601 acres (632 sq mi; 1,637 km2) of land from early February through late November, due to Red Flag conditions, destroying hundreds of structures, injuring 134 people, and killing two. The wildfires also caused at least $134.48 million (2009 USD) in damage. Although the fires burned many regions of California in August, the month was especially notable for several very large fires which burned in Southern California, despite being outside of the normal fire season for that region. The Station Fire, north of Los Angeles, was the largest and deadliest of these wildfires. It began in late August, and resulted in the devastation of 160,577 acres (251 sq mi; 650 km2) of land as well as the death of two firefighters. Another large fire was the La Brea Fire, which burned nearly 90,000 acres (141 sq mi; 364 km2) in Santa Barbara County earlier in the month. A state of emergency was also declared for the 7,800 acres (12 sq mi; 32 km2) Lockheed Fire in Santa Cruz County to the north. I have a friend who lives in Aptos (just a few miles south of Santa Cruz) who lived pretty close to the fires. He was out of the country and had a friend stay there who was very nervous. They could see and smell the smoke. Many people in the Sonoma area started talking about the smoke and how it could affect the fruit. Some thought the 2009 vintage would have smokey notes. Of the 2009 wines I have tried, none have had any indication of smoke unless created by purpose by the winemaker. Aromatic, young-fruity with aromas of spice, cranberry and raspberry. Dry, full-bodied with balanced acidity. The tannins were soft. Silky rich mid-palate flavors with a savory long finish. 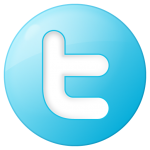 Region/Appellation: Sonoma, Russian River Valley. 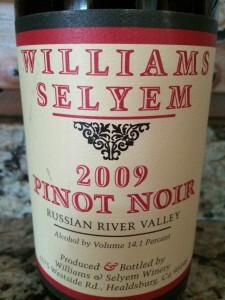 I rated the 2009 Williams Selyem Russian River Valley Pinot noir four glasses. 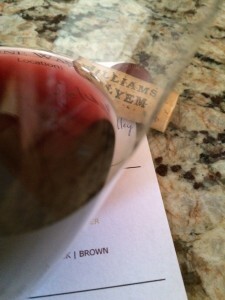 I think this was one of the better Pinot’s I have tasted from Williams Selyem.